Get Cashback on your Comprehensive Car Insurance Cover Plan find out about a Direct Asia promotion at ShopBack for a chance to save more! Enjoy Cashback or look for a Direct Asia promotion at ShopBack to save more on Group Travel Insurance! Enjoy bigger savings if you're travelling in groups! Save with the latest Direct Asia promo code and Cashback when you apply for Car Insurance with ShopBack! Don't forget to use ShopBack to get extra savings! Third Party Car Insurance - Save more by earning Cashback or find the latest Direct Asia Promo Code at ShopBack! More affordable and meets the minimum legal requirements! ShopBack has info on the latest Direct Asia promo code and Cashback so you can save on your Motorcycle insurance! Cashback off your motorcycle insurance plans! Find a valid Direct Asia promo code at ShopBack for more savings! A safety net for you made affordable with ShopBack! Individual Plans - Save with cashback or look for a Direct Asia promo code to save more! Direct Asia Travel Insurance: Find the best Direct Asia promotion to save more on top of Cashback with ShopBack! Find the latest Direct Asia promo code at ShopBack to save more on Individual Travel Insurance! Travelling solo? Make sure you got all bases covered! Not only does Direct Asia provide insurances covering your beloved vehicles, but also coverage from any shortcomings or mishaps that could happen to you as you travel. With the different agencies out there offering similar services, it’s a fuss to decide on the perfect insurance for you to purchase. Direct Asia’s travel insurances remain transparent about the coverage of the various plans, no matter if its an individual one, group coverage or even a coverage for your family, they’ve got you covered. Offering coverage while keeping it at a highly competitive price point, the Individual Travel Coverage from Direct Asia starts at a mere S$19. 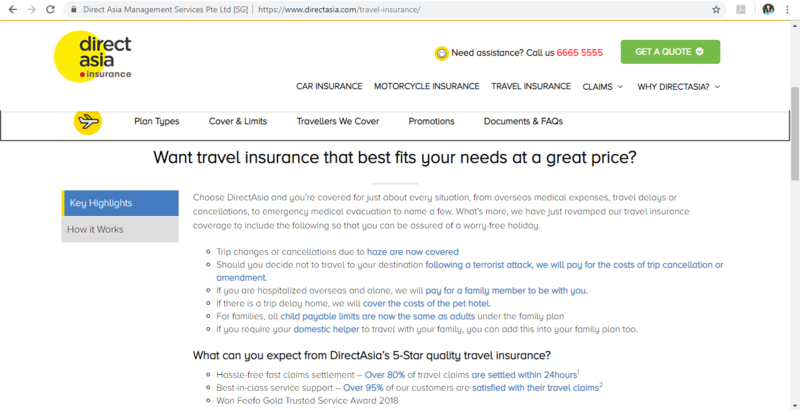 Upon arrival at DirectAsia.com, you’ll be greeted with the 3 categories of insurance they provide, simply select ‘Get A Quote’ on the vehicle type(s) and/or travel plan to get started. Next, you’ll be directed to the page where input of the detail of your vehicle(s) will be required, with a summation indicating the price of your current plan being shown at the top of the screen. Thereafter, you’ll be asked to declare the various necessary information regarding your commutes with the vehicle. Your final quote for the insurance plan based on the information you’ve provided and plan chosen will be shown at this next page. One last step before you checkout, at the ‘Review’ page you’ll be asked to review the information keyed in for one last time and agree to the terms of the plan you’ve selected. In any case when you face difficulties while trying to make a purchase online, the hotline is always available to aid you in your online purchases. As Direct Asia Insurance is an online insurance provider, payments are solely made through card payments on their website. All payments, renewal of plans and any other purchases made through their websites must be done with a credit card accepted by Direct Asia Insurance. Sensitive information like credit card details should not be sent to Direct Asia Insurance by mail or e-mail. Periodically Direct Asia Insurance hold promotions when you register your vehicle(s) and/or travel plan with them. Below is a list of running promotions happening right now, promotions are subjected to change in accordance to the promo period. No Claim Discount - get an additional Direct Asia promo code of 10% discount at checkout with promo code NCD60 for vehicle insurances. 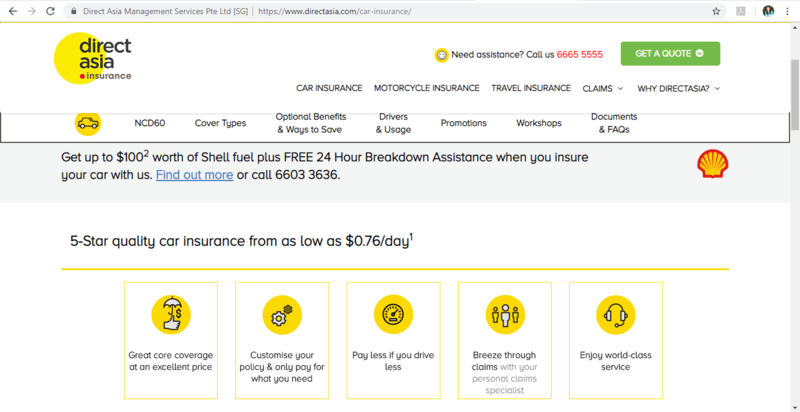 S$100 worth of Shell fuel plus AND free 24 hours breakdown assistance when you insure your car with Direct Asia Insurance. Second vehicle promo - Insure your second car/bike with Direct Asia Insurance and get an extra 10% discount. Refer a Friend - get up to S$100 worth of rewards for BOTH you and your friend when you get him/her to purchase any of the Comprehensive plans! This Promotion is applicable only to customers who purchase a NEW, Comprehensive car insurance policy for a minimum of 12 months (365 days) during the Promotion period. Simply insure your vehicles with Direct Asia for the first time to obtain S$100 worth of Shell fuel plus and free 24 hours breakdown assistance. Select the ‘Second Car/Motorcycle’ option during registration process to get a further 10% reduction to your final bill. Refer a friend works ONLY when your friend calls in and mention to the customer service hotline that they’re opting for the refer a friend promo. Do ask the friend you’re referring to mention your NRIC number and full name as registered to ensure the rewards go to the right person! With ShopBack, your already discounted insurances are now made even more affordable! Purchase of any Direct Asia Car Insurance entitles you to a further S$60 cashback as long as you shop through ShopBack. Purchase of any Direct Asia Motor Insurance gives you an additional S$20 cashback as long as you shop with ShopBack. To avoid any unintentional cancellations, answer the questionnaire to the best of your ability. Incorrect information submitted for the registration of the insurance risks the validity of your insurance in any case the insurance is utilized. Insurance payment must be made before the due date specified in the relevant confirmation details provided by the client. Inability to do so risks the disruption of the insurance and its coverage. Payment received after the stipulated due date shall have no effect on the cancellation of the policy. Both Direct Asia and the client own the rights to cancel your insurance plan at any time given a 7 days’ notice. Direct Asia insurance’s service center and and customer service hotlines operate from Monday - Friday, between 8am - 8pm. Claim related and 24 hours hotline remains reachable at all times. Are you looking for an efficient and reliable insurance company to insure your vehicles and travel plans? Look no further because Direct Asia Insurance is the answer for all your queries. Direct Asia Insurance is an online insurer that offers online direct-to-customer insurance services. One of the leading online insurers in Singapore, the company offers a one-stop platform to get quotes, policies and managing the coverage experience until claims. Customers even get the opportunity to customize their insurance policy as per their requirements. All they need to do is log in on www.directasia.com website and safeguard themselves against any crisis concerning their valuable car, motorcycle or holiday trips. Direct Asia Insurance (Singapore) Pte Ltd was registered as a direct insurer in Singapore on 18 May 2010 under the Insurance Act of Singapore, to carry on general insurance business. While most insurance companies in Asia are heavily dependent on the agent model, DirectAsia has adopted a direct business model that enables the company to offer lower insurance premiums to its customers by eliminating agents from the insurance chain. This proved to be favourable for DirectAsia. The company expanded beyond Singapore in 2012 and 2013 by entering the Hong Kong and Thailand markets. In 2014, Direct Asia Insurance (Holdings) Pte. Ltd. (DAIH) was acquired by Hiscox Ltd., an international specialist insurance group listed on the London Stock Exchange. Over the years, DirectAsia Singapore has served more than 75,000 customers, settling more than 51,000 claims. The company has also won many accolades for its top-notch services such as Feefo Official Gold Trusted Service Award 2018, Best Insurance Brand in Brand Digital Excellence Awards Singapore 2016, Best Online Buying Experience Excellence Awards 2016 and 2015 Asia’s Top Influential Brands – Direct-to-Consumer Insurance. DirectAsia Insurance mainly deals in vehicle and travel insurance. The company offers quick and convenient online insurance. Here is a brief discussion on the various products offered by the online Insurance company. Car Insurance: Get your car insured at trustworthy Direct Asia Car Insurance that promises to cover a variety of issues such as injuries in accident, damage to property in a car accident, legal costs and expenses following an accident, theft, damage by flood or a natural disaster and much more. The company offers 3 main insurance plans that are Comprehensive plan, Third Party Fire Plan (TPFT) and the Third Party Only plan (TPO). Choose an appropriate plan and customise it as per your requirements for a stress-free life. Motorcycle Insurance: Customers can bag great Direct Asia Motorcycle Insurance policies at amazing prices. The policies are not only customisable, but they also give you the freedom to choose your own garage for the repairs. With Direct Asia Insurance’s highly trained and knowledgeable customer care specialists, you can rest assured that your claims will be handled efficiently and hassle-free. Travel Insurance: Direct Asia Travel Insurance covers almost all situations, from travel delays or cancellations, overseas medical expenses, to emergency medical evacuation and much more. The plans are available for individual travellers, families and even groups. DirectAsia Insurance ensures through its various beneficial policies that you have a wonderful worry-free vacation with your near and dear ones. Direct Asia’s official website offers a simple and hassle-free interface for buying your insurance policy. The header on the homepage features three categories of insurance i.e. Car insurance, Motorcycle Insurance and Travel Insurance. Click on the type of insurance policy you intend to purchase. If you select ‘Car Insurance’ you will be directed to the page displaying all the information regarding available Direct Asia car insurance policies. You can explore different types of plans offered by the company, cover and limits, optional benefits, Direct Asia promotions, documents & FAQs and the like. After going through all the important information, scroll down and click on “Buy Online Now”. You will land on the page where you need to provide details about your vehicle and the main driver, and select your coverage and plan. Once you’ve entered all the details, click on “Get a Quote”. You will receive a quote from Direct Asia insurance, identified by a quote number. This quote and quote number will remain accessible on the website and will be valid for up to 90 days. If you wish to proceed with the provided quote, you can make a request and offer to Direct Asia for the purchase of the selected insurance product. Direct Asia may accept or reject your request after going through all the details and documents provided by you. If they accept the request, you will receive a Direct Asia policy number to create a binding insurance agreement with the company. Since, Direct Asia is an online insurance company, it accepts payment via credit cards verified by VISA or MasterCard. This reliable mode of payment allows you to make quick and secure online payment of premiums. Simply enter your card number, date of expiry and CVV/CVC number in the payment window and proceed with the online transaction. Direct Asia offers plenty of discounts and deals under its promotion section in each type of insurance. Whether you’re taking a Direct Asia bike insurance policy or a Direct Asia travel insurance, you can find a number of Direct Asia promo codes listed under the promotions. Some of these Direct Asia promo codes are applicable for limited period, while some referral codes can be availed at all times. Simply use Direct Asia promo code 2018, available on the official website of the company and earn great discounts and cashbacks. At present, customers can earn $60 cashback on Direct Asia Car insurance, $25 cashback on Direct Asia motor insurance and $35 cashback on Direct Asia travel insurance if they buy their policies through a registered account on ShopBack. Getting insurance is no longer a hassle with Direct Asia. The online insurance model of the company not only makes the process extremely convenient but also gives you plenty of opportunities to save money on your purchase. Several websites offer codes and vouchers that can be redeemed to earn cashbacks and discounts on insurance policies. Step 1: Select the type of insurance you wish to purchase. 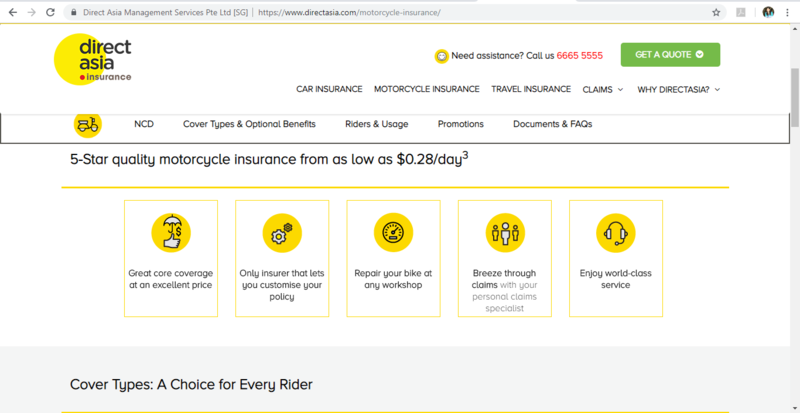 Suppose you select Direct Asia Motorcycle insurance, click on ‘Promotions’ featuring on the header of the page. Step 2: You will be directed to the promotions page where you can find a deal offering 10% discount on insuring 2 motorcycles. Go through the details and click on “Get a Quote”. Step 3: You will be sent a quote by the Direct Asia motor insurance specialists. Proceed with the process by providing your vehicle and driver information. Talk with a Customer Care specialist of Direct Asia on +65 66655555 and get 10% discount activated on your second policy. Step 1: Visit the ShopBack website and select Direct Asia store from the list of merchants and brands under the travel section. 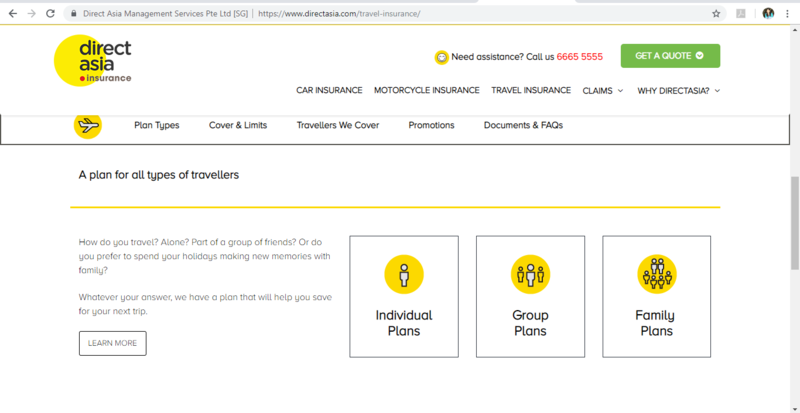 You can also use the search box to find the link to DirectAsia Insurance store. Step 4: If you are willing to find more attractive deals and coupons, check out the 'Direct Asia Insurance Promo Codes November 2018 ' section. Step 5: You will be directed to DirectAsia website to browse and select the policies you intend to buy. Step 6: You will be eligible to earn cashback from ShopBack on finalising your purchase. The cashback rates might differ based on your history with ShopBack, i.e. whether you are a new or an existing customer. The cashback offer is not applicable on purchases made on ShopBack mobile site/app. To the extent permitted by law, customers will receive all of their insurance documents electronically. There may be some insurance documents that Direct Asia cannot deliver electronically due to legal and technological constraints. These will be posted to the customer. On Direct Asia’s website, you can make certain transactions online such as purchasing a policy, administering a policy, making a renewal payment or other transactions. These transactions will not be final until Direct Asia Insurance receive and process your confirmation. Before Direct Asia provides cover, the customer must fully and faithfully tell Direct Asia everything they know or could reasonably be expected to know that is relevant to the company’s decision to give the insurance. Otherwise the customer may receive no benefit from his/her policy. All payments for any insurance products, renewals, or other services purchased via Direct Asia website must be paid in full by the due date specified in the relevant confirmation. There are more terms and conditions on the official website that customers can access. For any assistance or information, customers can contact the Direct Asia Insurance customer service on 66655555 from Monday to Friday between 8 am to 8 pm, or write to them.